Needs determine which products and services people are using. While offerings evolve and advance over time, needs remain unchanged. For creators it is key to uncover and address basic human needs to create successful offerings. The more a product or service is satisfying one or more needs, the more likely it is used, re-used and recommended to others. In psychology needs are distinguished from wishes. A wish is what a person desires or wants to have. In contrast, a need is what she requires to live a healthy life or simply to survive. 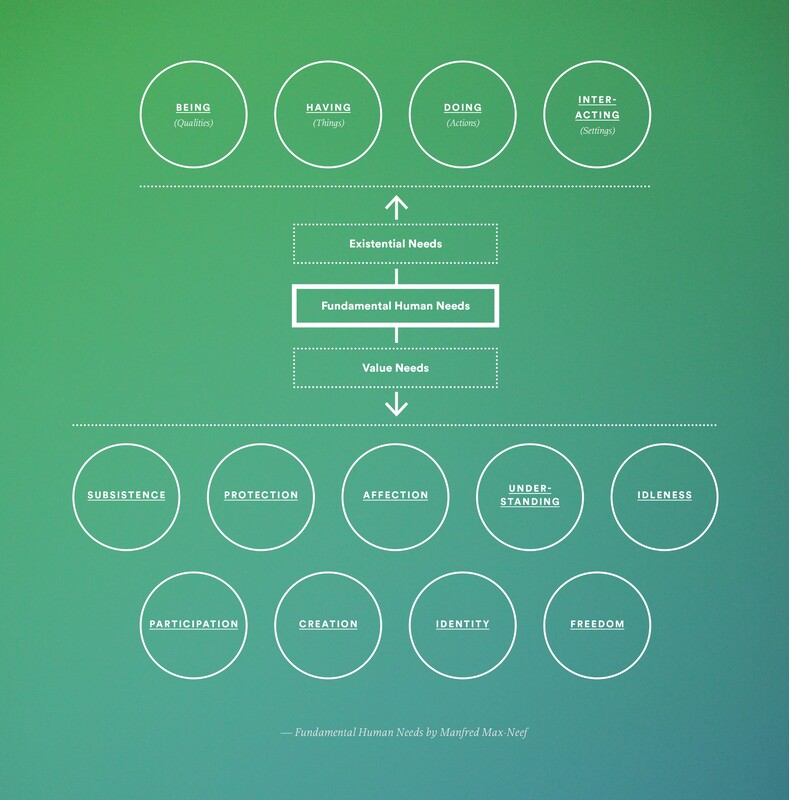 Earlier psychological models such as Abraham Maslow’s describe a hierarchy of human needs. He suggested that physiological and safety needs must be met before the individual demands higher level needs. Such are love and belonging, esteem, self-actualisation and eventually self-transcendence. Maslow’s model remains a theory though. Current research disproves a ranking of needs — apart from the most basic need for survival. The Chilean economist Manfred Max-Neef describes needs as simultaneous and complementary instead of hierarchical. He suggests that there are a few and finite human needs — compared to wants which are infinite and insatiable. Furthermore, Max-Neef claims that needs are constant through all human cultures and across history. According to this, the biblical search of Maria and Joseph for shelter on Christmas Eve is not any different from a traveller using her Couchsurfing app to find a free sofa for tonight. In similar contexts needs arouse the individual to action towards the same goal. The need of protection is consistent in both cases while the approach — knocking on doors to eventually find a barn versus using a gps-enabled device to locate people who offer their spare beds — is different. The contemporary solution is faster and more efficient than the ancient one while the outcomes are equal. Max-Neef proposes to classify human needs according to two criteria. Firstly, existential needs are being, having, doing and interacting. These describe qualities, things, actions and settings. Secondly, value criteria are subsistence, protection, affection, understanding, participation, idleness, creation, identity and freedom. Combining both criteria creates a needs matrix which consists of 36 fields. Those can be used to identify potential satisfiers of the fundamental needs. A satisfying action related to the need of affection for example is sharing — an attribute which is embraced by many digital services today. In the pursuit of happiness humans strive to satisfy their needs. They attempt to fulfil personal and social goals to reach it. Hence an economical objective should be developing offerings that incorporate various satisfiers to the described fundamental needs. The evolution of artefacts collected in our ‘Things Do Jobs’ blog illustrates the success of ‘synergic satisfiers’ over ‘singular satisfiers’. 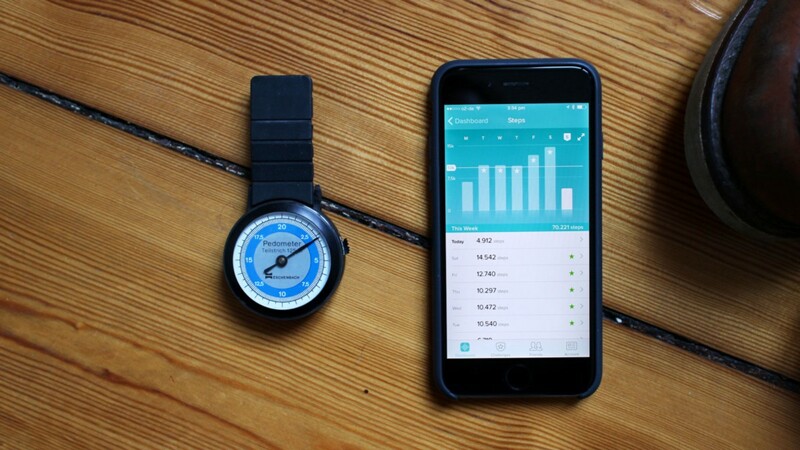 An analogue pedometer almost exclusively addresses the need of understanding. Its enhanced digital counterparts such as Fitbit or Jawbone in contrast have extended functionalities. They additionally address the needs of affection and participation by including friend lists, messaging and collaborative challenges. By not only satisfying one particular need, but also leading to satisfaction in other areas the connected version of the pedometer is perceived as a better solution to find fulfilment. Eventually the version that creates a higher value will replace its precursors. In order to create a successful new offering it is crucial for creators to understand which fundamental needs their invention is going to address. During the development process it is necessary to ensure that the offering excels existing ones in satisfying those needs. The chances of success are further increased if the new solution can satisfy more than one singular need, in best case even multiple ones. In addition to that, it is useful to trace and examine others’ failures, especially technology flops. These might have satisfied some needs not well enough or, even worse, unintentionally inhibiting the satisfaction of another need. Google Glass might have been great at fulfilling the need for understanding one’s surrounding, but at the same time decreased the possibility for social participation by compromising other people’s need for protection and identity. Therefore universal needs should be recognised as an interrelated and interactive system. By understanding and embracing this creators can succeed at developing desired connected objects. William Kremer, Claudia Hammond (2013): Abraham Maslow and the pyramid that beguiled business. Retrieved April 19, 2015 from http://www.bbc.com/news/magazine-23902918. John G I Clarke (2013): Manfred Max-Neef explains the Human Needs Matrix. Retrieved April 18, 2015 from https://youtu.be/jJTvd0Yg2hk. The Rainforest Information Centre: Max-Neef on Human Needs and Human-scale Development. Retrieved April 17, 2015 from http://www.rainforestinfo.org.au/background/maxneef.htm.